Last week I ve participated in a scenario to map out possible futures of Kim Jong Il’s sudden death. My best guess is in my previous post – a military dictatorship with Kim III (Jong-Un) as a familial, yet much reduced, figurehead. But one idea that is always floating around in the background is that major regime junctures in the North might lead to break down and then unification. President Lee has taken recently to saying that SK should prepare for imminent unification, and one of my favorite NK experts thinks unification is likely in the next five years. Does anyone else think this is likely, and why so (in the comments below, please)? I don’t see that actually. a. Both nations were divided artificially. Both sides believe the ‘2 states, 1 people’ outcome is temporary. All 4 states face a permanent constitutional legitimacy crisis, because the obvious question is why these separated states exist at all. As such, all states divided by the Cold War were intensely competitive with the other. Outracing each other economically, militarily, even at the Olympics, became central to proving who was the ‘real’ Korea, Germany, Vietnam, China, etc. Mutual coexistence is basically impossible; each has a limited time window to race the other into international legitimacy. As one or the other pulls away in global opinion – as it becomes ‘the’ Korea or ‘the’ Germany in places like airports or hotel signage, popular movies, CNN, etc. – it will become ever harder to justify maintaining the division. b. NK and EG (East Germany) are both communist with all the attendant problems of 20th century ‘real existing socialism.’ They are domestically illegitimate outside their own elites. Those elites are a corrupted ‘red bourgeoisie’ for whom regime ideology became a figleaf for oligarchy and luxury. Neither can produce anything close to the quality and quantity of goods necessary to keep their populations happy – populations further disenchanted by what they see on the other side. Both have a nasty secret police. They are both noticeably poorer than the westernized competitor, and this creates unending pressure on the government to change. All these factors create a disconsolate citizenry that would push out the regime if given the chance. Hence, any manner of internal democratization or liberalization would end the regime as we know it. In the end, both communist half-states had to seal off their borders to prevent exodus; they are national prisons. c. Underperformance vis the westernized competitor slowly takes its toll internationally. The competitions led to hyper-militarization in the communist half, which only worsens the performance gap between both sides. Perhaps the best marker of the communist failure after a few decades was that West Germany simply became Germany and South Korea just Korea. To indicate the communist half in everyday speech, one had to affix the directional adjective, the implication being that EG and NK were somehow dead-ends of history. By the 1980s, both NK and EG had effectively lost the race of point 1a above; SK and WG became Korea and Germany. d. The westernized, ‘Free World’ half of the nation is a wealthy, functioning democracy that has otherwise joined the world – technologies, markets, and institutions (IMF, WTO, etc). This makes the communist half look even more like a basket case. Gradual but sustained wealth and demographic accumulation have dramatically altered the balance against the communist half. The free half also regularly receives communist refugees voting with their feet. a. SK and WG are clearly supported by the US and its wealthy democratic allies. Both belong to American/democratic alliance system and enjoy the widespread moral legitimacy that comes from that. They are net contributors to their own defence, clearly outclassing the communist half strategically. b. NK and EG are practically client states of a communist behemoth, on whom they are extremely dependent. The patron of both finds them troublesome and expensive. Both field an military based around obsolete WWII assumptions of massed infantry and armor formations. Neither can win a conflict with the other half; the economic gap compounds the military gap. The patron regularly debates the merits of cutting the client loose. c. The neighborhood got used to the division and kinda likes it (especially Japan and France, although no one will say that publicly). There isn’t a lot of impetus from outsiders to end the split. Russia couldn’t care less if Korea unites. Like the French and British on Germany, the Japanese public will come around once they see it on TV. Once we see crying Koreans tearing down the barbwire fences of the DMZ, like we saw Germans hammering the Berlin Wall, no one will stand in its way. But until then, don’t expect anyone else to do much beyond pro forma boilerplate. This entry was posted in China, Europe, Korea (North), Korea (South), United States by Robert E Kelly. Bookmark the permalink. Interesting post. As a completely uneducated spectator, I do have a view point. Did the ‘Germany’/’East Germany’ monikers adapt themselves in languages outside the democratic west? Is there a chance this is a local perspective? However, I understand a bulk of the economic/diplomatic clout is maintained in the west, and generally the definitions they use to define the world are the ones that matter most. Second, from the little I know, there have always been whispers of regime failure in North Korea, for over 70 years. While I have come to believe that a slow merging of the two countries through programs such as the sunshine policy is complete fantasy (again, in the 70th year with little change in relationship), I just don’t understand what engine would be able to dismantle the North Korean Regime. I don’t hear about any of the traditional overturning forces at work in the country (guerrillas, peasant uprising, etc), and unlike other suppressed societies, I don’t see much evidence that North Koreans have a desire or the will power to organize and fight back. From what I can determine, even if the current regime fails it can easily be replaced by whomever assumes power (someone already high ranking) and the transition will probably be transparent to the people and the resulting differences from the current regime will only be a couple names at the top. I am actually fairly pessimistic about NK’s implosion. I don’t see particular reason why it should be soon, although the Arab Spring right now is teaching us just how unpredictable explosive revolutionary outbusts are. It’s just so hard to even guess. I have fuller thoughts on this here in the comments section: http://www.busanhaps.com/article/reunification-german-comparison-part-i. Also, isn’t there a strong correlation between the development of a middle class and the overthrow of a ruler? I’m trying to think of more examples of why or why not the NK government won’t have any problem keeping people in line during a rocky power transition. In the middle east, a lot of the forces acting there (high unemployment, educated or globally plugged-in youth, disenfranchisement, and hope) don’t seem to exist in NK, is that correct? All those forces exist in NK, and yet worse. The real issue blocking domestic NK mobilization is the orwellian levels of indoctrination, the lack of much civil society capacity to push back on the regime, and the regime’s demonstrated willingness to slaughter its own people in order to survive. So much of the unification centers around efficacy and the economics. But, what about the military and security aspects? Could you remind us of the security debate surrounding German unification? That’s all coming in parts 2 and 3. The short answer is that the Cold War was winding down, so it was easier for the USSR; while in Asia, China’s rise is just starting, so the Chinese are going to push harder. as a German (living in Korea), I can answer your question from a personal perspective. The Eastern German and the Western German language per 1988 differed quite a bit. I am not talking about the local dialects (which are quite different, too). The were simply many terms in Western German that Eastern Germans didn’t know anything about (and vice versa). Nowadays, the Eastern Germans have learned the about 1000 Western German terms. While to my knowledge only 3 Eastern German words have migrated to unified German (Ossi, Wessi, Fakt ist). Basically the rest of the Eastern German language, brands, … were scrapped within a couple of weeks of reunification. However, quite a few people, who never want to see the changes and bad sides of EG, still glorify EG. Well, it is right that the unemployment rate was much lower then, but actually that was because 500000 EG-soldiers lost their jobs and especially 500000 spies from the EG domestic spy organization (Stasi). Furthermore, everybody got a job because they had to. In other words, you just got a job, which was totally useless, but you got it anyway, because the government said that everybody gets a job. That this is one of the main reasons why communist societies broke down – they simply couldn’t match the capitalist societies’ efficiency, because they simply educated their citizens to listen to orders and believe in the victory of the working class (and other BS). I think that is all basically correct. Interesting. Is it safe to say the Chinese are reluctant to accept NK refugees? How do NK refugees get past the DMZ to get to SK? Tough to emigrate to Japan because of the logistics of crossing the water? Yes, the Chinese complain about NK refugees. NK’s implosion will create a wave of them, which is ostensibly why China supports NK stability. (The real reason is to prevent a unified US ally emerge on their border.) NK refugees don’t go south. The go north. 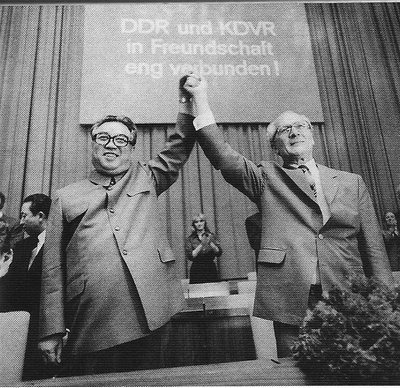 Pingback: Search #2: Germany and Korea, Reunification | Ji's Blog!